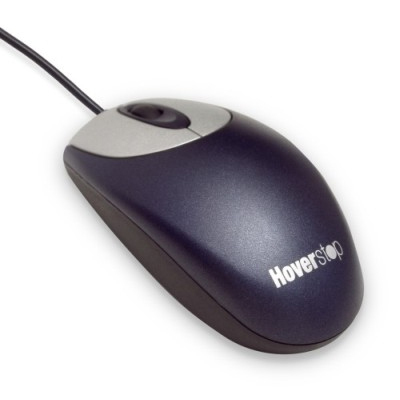 The Hoverstop active ergonomic mouse is suitable for rehabilitation and prevention of injuries and discomfort associated with computer mouse usage. The Hoverstop assists by changing the mouse usage habits that produce static loadings on the body. When actively using the mouse, it works like any other 3 button mouse with a scroll wheel. When you are not actively using the mouse, you still have tension in your arm, neck, and shoulder. After 10 seconds of passive mouse use, a vibration reminds you to take your hand away. You rest your hand and relax until you need to use the mouse again, without interrupting your work. Comfort - By using the Hoverstop ergonomic mouse system you will avoid unnecessary stress in your hand, wrist, arm, and shoulder, and increase the level of comfort whilst working on the computer. You will introduce a series of additional micro breaks while performing your normal work procedures. These micro breaks can add over 10 minutes of rest per hour to your hand and arm. These micro breaks will reduce the amount of tension in your body and allow your mind to focus on the task at hand. The short relaxations will help delay the onset of fatigue and will help you feel better throughout the day. The reaction to the vibration, taking your hand away from the mouse, will soon become second nature. Improved concentration and productivity - Physical stress, fatigue and pain have a negative influence on the performance of any individual. Allowing your body to relax , feel less tired and avoid discomforts from intensive mouse use will allow you to concentrate on your task and perform better. Repetitive Strain Injury has an immediate consequence on performance. 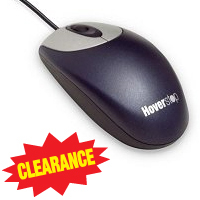 The Hoverstop mouse will help you focus on your task, reduce fatigue and help to prevent RSI. Compatibility - If you are using other ergonomic tools such as arm-rests, you can continue to use them without any problem. The Hoverstop mouse system will work perfectly with any type of break software already in use. It can be built into any mouse or input device, should you have special requirements towards a specific shape or type of mouse. How does it work? : The Hoverstop ergonomic mouse detects if your hand is on the mouse. It then monitors if you are actually using it (clicking, scrolling). If you are not using it for more than 10 seconds, it will vibrate softly, reminding you to take your hand away and relax. This will give you several micro breaks per hour. Meanwhile you continue to work normally (thinking, reading), without being disturbed. If you need the mouse again, just pick it up to resume work. Technology used: The mouse has a built-in sensor that detects if there is a hand close to or on the mouse. It then starts a timer-counter. Mouse action (clicking, scrolling) is monitored. If there is no mouse action for more than 10 seconds, the built-in vibration unit is triggered. The vibration will continue until you click the mouse or remove your hand. Every time you click or scroll the timer-counter is reset to zero, so during ordinary, active use of the mouse a signal is never generated. Software setup: No software other than the operating system default driver is required for normal operation of the Hoverstop mouse. The default driver of your operating system will allow you to adjust settings like mouse speed and double-click sensitivity. 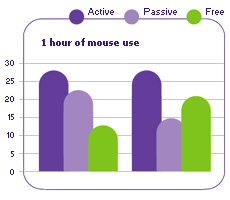 All neccessary functions are performed by the mouse itself, not using processor time from the PC or slowing it down. Just plug it into the USB/PS2 port and start using it. Here you see what happens with your muscles when you are using a mouse. : The red line shows the tension in your arm-muscles. When you are actively clicking and scrolling, you can see some peaks caused by movement. 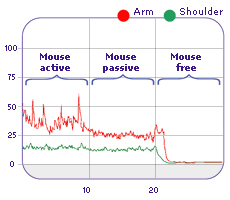 When you leave your hand on the mouse (mouse passive) and try to relax, the peaks disappear, but the muscle tension remains elevated. Only when you release the mouse and rest your hand on the table, your muscles will relax. Do you know how often your hand remains tensed on the mouse without actually using it? : Up to 30 times per hour! Total passive mouse time can run up to more than 10 minutes per hour. Save yourself this time and tension, release the mouse and relax!